The Procull tree mountable humane dispatch squirrel trap; Patented GB2523384, is a new trap designed and manufactured here in the UK. Tested against the latest humane standards, the Procull was granted ‘Approved’ status by DEFRA in March 2016 for use against grey squirrels in England. Although it may look a bit like a cage trap, the Procull has been developed to deliver a very quick and humane kill.. Grey squirrels are a non-native species making it illegal to release any captured individuals back into the wild. 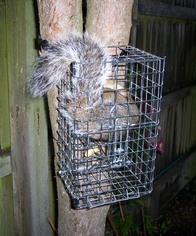 The Procull is the ideal choice for those who are concerned about the humane dispatch of grey squirrels. Easily camouflaged with local materials such as twigs and leaves entwined in the cage walls or covered with hessian or plastic.